The Hudson K-8 School Mathematics, Engineering and Science Achievement (MESA) team took first place in the middle school competition at the state finals held recently at UC Santa Barbara. This year’s competition focused on wind energy. Students were required to build a device to capture wind energy that could lift the most weight and pull the heaviest car in the least amount of time. Hudson team members are Breanna Nery, Rae-Jillian Rivera, Kimberly Ventura, and Reginald Lata. Their advisor is James Mills. The Hudson team had taken first place in the regional competition at UCLA in April. Their win in Santa Barbara means they qualify for the MESA National Challenge in Denver on June 24 to 27. The Cal State Long Beach MESA program is sponsoring the Hudson team for their trip to the national competition. 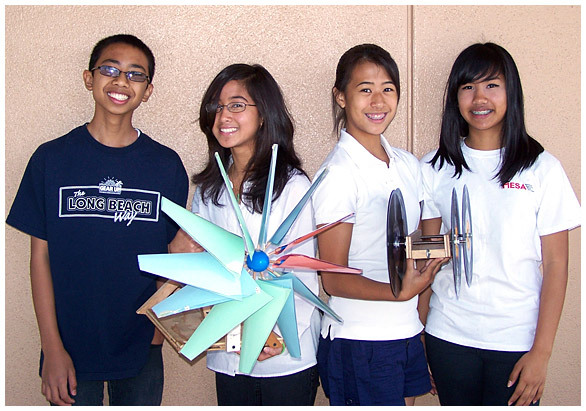 WIND POWER -- Hudson K-8 School's Mathematics, Engineering and Science Achievement team won the MESA middle school state championship recently in Santa Barbara. Team members are Reginald Lata, Breanna Nery, Rae-Jillian Rivera and Kimberly Ventura.